lasers, pyro, all manner of special effects, soft goods, screens, stage design and creation of custom set peices. Have designed and toured lighting systems to 180 conventional lamps and 75 automated fixtures. Own eXotic Lightings inventory for tour augments: color changers, moving lights, strobes, hazers and fog machines, confetti cannons, follow spots, intercom and a number of other effects. Designed and programmed many pieces of custom lighting equipment. Have built and crewed systems to 2500 lamps. Ted Nugent: Full summer international tour. 110 shows in 120 days in 40 states and 20 countries with the smallest show being about 2,000 seats, and the largest being 40,000 seats. This tour ncluded the live filming of Ted's 6,000'th concert. Tripod: Spent most of a summer in Europe (mostly Germany and Croatia) doing the large (30,000 seat) festival circuit. Genitorturers: Spent 2 years as the Lighting Designer for this band. Typical shows were in the 500-3000 seat range. This was a bus and trailer tour of the US. Took a full lighting package that I set up (using house loaders) and ran every day. Including front floor trusses, 13 pieces of automation, smoke, strobes, and a full set of floor cans and dimmers (requiring a power tie in). Worked closely with the band to ensure that the look onstage was consistant from day to day. Worked with house LD�s to program our show into their gear every day. Called follow spots most nights. SPS: Spent 4 months in charge of a 180K conventional rig in the midwest doing county fairs (2000-10,000 seat events) as crewchief and often also as Lighting Designer for the shows at each event. Worked as LD for such artists as Sugarland, Craig Morgan (Redneck Yacht Club), Steve Azar and many more. Recently became the FIRST (and so far ONLY) Lighting Designer to place automated LED color changers on the roof of Seattles most visible landmark building: The Seattle Space Needle. King 5 news carried a peice on that party and commented favorably on the coloring of the roof. Lighting Designer/Equipment provider/Crew Chief for LEAP Fest, large outdoor music festival in Redmond. Lit the Spokane Water Power building windows for an ice skating event. Created a repeating 11 minute show in the windows of this building behind a flag pavilion to highlight the event for people coming and going. Aspen 4th of July celebration. 4th of July party for a small town near Aspen Colorado (3000 people on a ski slope) involving lasers, conventionals, fog machines too numerous to count, moving lights, projections, and using the audience as a functional element of the show. When in Seattle, I act as the part time "House" Lighting Designer for the Tulalip Casino (60k rig with 8 moving heads). Designed and installed the lighting system for the Capitol Hill Arts Center. Temporarily the house lighting designer there. This is a mixed use Theatre/Live music system. My lighting design for thier premier production of David Mammet's "Glenn Gary Glenn Ross" was called "Lush" by the Seattle Times. Designed and installed the lighting system for The Vera Project (All ages live music). 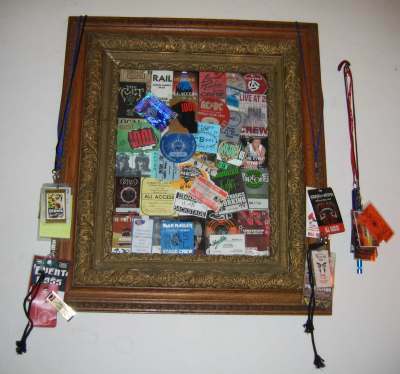 Showlites (5 years): Crewchief, designer for smaller one-off shows. While there, I designed and ran the show for a number of 150 lamp benefits. Supervised the construction of many of the large tours that went out (and acted as crew on some) including the dual 2500 lamp (5000 lamps total) Monsters of Rock tour. This was a 6 month Large Club bus based tour. I brought some personally owned equipment to augment the clubs systems. * House Lighting Designer for Bogarts, Long Beach Ca. Designed and ran all shows, with talent like Missing Persons, Lone Justice, Red Hot Chili Peppers, Concrete Blonde, and Guns-n-Roses Designed the house lighting system. * Numerous LA shows in the Roxy, Troubador, Gazarries, Waters Club, Faces (Huntington Beach). Built the lighting grid for Conworks, a nonprofit arts/theatre space in Seattle, and designed their grand opening production of "Invaders From Earth". Designed the "Richard Rodgers Musical Review" for the Burien Little Theatre. This show was a sellout smash during it's run, and included the use of some color changer fixtures. Designed the lights for several of the productions of the Asian Theatre Group in Seattle. Several recent large concert format music video shoots, some as LD some as DP. Co-production of a video lecture series with the Museum of Flight. Formerly produced and edited a local Public Access Television series ("Norwescon") a 1 hour per week show.